As an IT manager, maintaining physical fax servers and infrastructure is not a high priority. However, fax capability remains a business need simply because chances are your industry is dependent on its security. What if there was a way to reduce the amount of time spent handling fax complaints and maintaining physical servers? And this way took into account security, cost savings, and freed up your IT resources. Would you be interested? 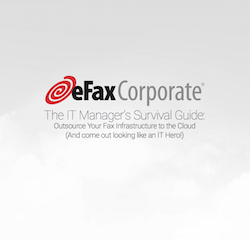 Download and read our white paper The IT Manager's Survival Guide to see how a fully hosted cloud fax solution can benefit your company.